Days are finally getting longer now that we have reached the winter solstice. 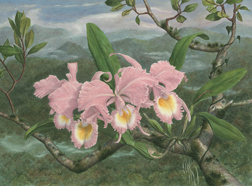 Many orchids use a lengthening day as a cue to begin the flowering process. Greenhouse growers can sit back and let Nature do its thing, but those growing indoors need to provide an increase in day length in the next month to initiate spring flowering. While we typically think that winter is a difficult time for our orchids, remember that many tropical orchids come from relatively high elevations and so the cooler nights and days are ideal for them. Miltoniopsis, Lycastes, Odontoglossums, Phragmipediums, and numerous other genera that suffered from the heat for much of the year now thrive. Some orchid growers include cool growing orchids in their collections and provide lots of shading or even air conditioning in summer to provide cooler temperatures. Even many orchids that do well in summer thrive when the stress of high temperatures is relieved. Cool days and even cooler nights slow down plant metabolism (activities in the plant that use energy). When light is hitting orchid leaves the temperature inside the orchid leaf is much higher and the plant can regulate that temperature to maximize photosynthesis even in cooler conditions. At night, however, cooler temperatures also slow down an orchid’s metabolism allowing your orchid to retain and store more of the energy it captured during photosynthesis. If you have a cattleya that grows new pseudobulbs in winter and summer, winters bulbs are usually thicker as a result. Unfortunately, orchids from very warm, tropical environments, such as phalaenopsis and vandas, may almost cease growth if temperatures remain below 60 F for long periods. Remember that there are exceptions to every rule and hobbyists that have added species to their collections need to consult the orchid literature to determine the natural conditions for a species and do their best to maintain those conditions. While most phals like it warm, >65 F, some of the miniature species and their hybrids, e.g. Phal parishii and lobbii do better with cooler nights. Cymbidiums are a group that suffers during hot summers, but grow extremely well in winter. They will even thrive outside in the southern part of the country, as long as they are not allowed to freeze. Once spikes are observed, however, move them inside or somewhere where they can be maintained above 50 F to avoid damage to sensitive buds. Most cattleyas need to be kept on the dry side now. It is OK if there is some shriveling of the bulbs, but the leaves should not shrivel too. A dry period is especially important for cattleya species to ensure quality blooms and to maintain a healthy root system. One common mistake is to substitute misting for watering. Misting can help maintain higher humidity in winter, when low humidity can be a problem, but plants still need a thorough soaking just less frequently. If you do mist, use deionized or distilled water to prevent salt buildup on leaves. Phalaenopsis and most of the popular intergeneric oncidiums are in bloom this time of year and require more moisture than cattleyas. They too, are growing more slowly and care is required to prevent rotting roots.